AR 1476 as photographed May 10 through the clouds by Jay Reynolds. Sunspot group AR1476 finally spit out a coronal mass ejection (CME) though perhaps a bit late for a direct shot at Earth. The active region has been the focus of much attention from solar-interested scientists and amateur astronomers of every ilk. The huge grouping is rotating away from the center of the Sun’s disk and will soon pass over its limb. In the mean time, clouds and inclement weather are moving into the Northeastern Ohio area, obscuring the fascinating markings … visible to the unaided (but properly-protected) eye. 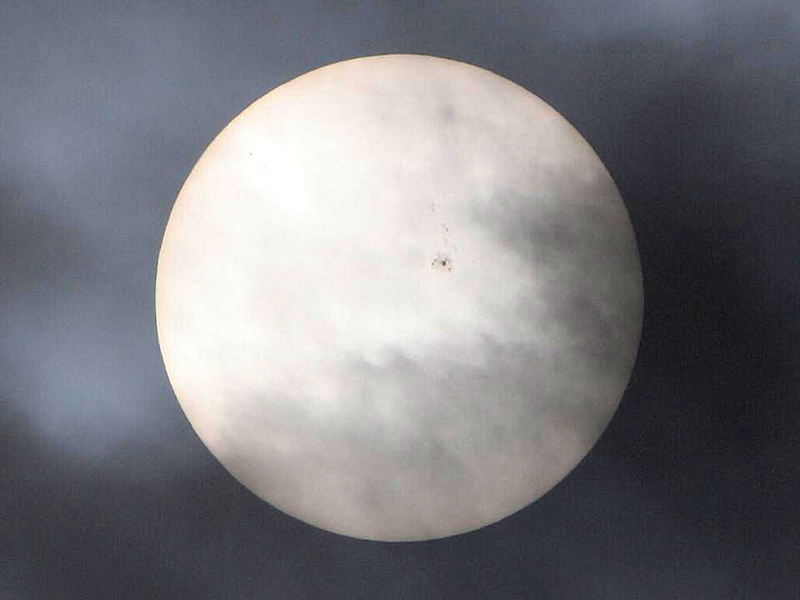 Photo Notes: AR 1476 as photographed through the clouds May 10, 2012, by Jay Reynolds who was birding when lake effect clouds reduced the brightness enough to get this photo. Canon 400mm telephoto, 1/1,250sec., f/13. Extreme caution is warranted when photographing the Sun. A clearing in the clouds or a hole in a solar filter can instantly and permanently damage the eyes. This entry was posted in Uncategorized and tagged AR1476, astronomy, astrophoto, photograph, photography, solar, sun, sunspot. Bookmark the permalink.